Made for fashion-conscious buyers rather than fitness fanatics, the Diesel On Full Guard combines an attractive design with a great screen, but is lumbered with poor stamina and is lacking key functionality, such as GPS, NFC and a heart rate monitor. For the price, you can do a lot better – you're essentially buying the brand here, rather than a leading Wear OS timepiece. Depending on who you talk to, the smartwatch war is all but over, and Apple won. Google's Android Wear initiative tried to take down the Apple Watch a few years back but didn't make much of a dent. Google has since gone back to the drawing board, renamed its smartwatch platform 'Wear OS' and has enlisted the assistance of brands like TAG Heuer, Hugo Boss and Fossil, to give consumers something that even Apple's product can't manage: a sense of real fashion. The Wear OS range is populated by smartwatches that don't actually look like smartwatches, which – Google hopes – will make them a more mainstream proposition. Diesel is also joining the Wear OS party and is perhaps one of the most important allies Google has in the next phase of the wearables war. Its Diesel On Full Guard timepiece is therefore one of the key Wear OS devices on the market right now – but does it have the functionality to match those devilishly good looks, especially at the lofty price of $325/£329 (around AU$435)? As is the case with many of the watches running the second generation of Google's wearable operating system, the Diesel On Full Guard has a round face and looks like a 'normal' watch you'd find in your local jewellers. It's quite chunky and is fashioned predominantly from metal; the strap is leather (although a metal alternative is also available for $25/£20 more) and the only part of the watch that is plastic is a panel on the back, via which the watch's battery is topped-up using the supplied charging pad. On the right-hand side of the watch you'll find a rotating crown which can be used to scroll through menus; a short press opens up the main Wear OS menu, while a long press triggers Google Assistant. Two more buttons – situated above and below the crown – grant access to common shortcuts and suggested actions, such as checking the weather and browsing suggested apps to download. The black strap supplied with our review model is made from genuine leather and, as you might expect, shows signs of wear quite quickly; creases appear after a day of use, which is pretty normal for this kind of watch. The straps have a quick-release mechanism which means they're easy to remove and replace. Given its large size and hefty weight, the Diesel On Full Guard can be slightly uncomfortable, especially if you have slender wrists. The metal frame does have a tendency to dig into the skin as you move your hand, so you might want to try it on for size before making a purchase. While it's not being marketed as a fitness watch, the Diesel On Full Guard is pretty robust – it has water and dust resistance and is capable of withstanding a fair degree of punishment. However, given its status as a fashion accessory – and the fact that there's a leather strap that can pick up marks and scuffs – we imagine most people will wear this on a night out on the town rather than on a demanding hiking adventure. If you've been following Google's smartphone OS since day one then you'll no doubt recall the Moto 360, which was unique for its circular display. However, to fit in the ambient light sensor Motorola had to include a black slot which gave rise to the term 'flat tire' – today, it might have been referred to as a 'notch', like that seen on the iPhone X.
Mercifully, the days of the 'flat tire' are behind us and the Diesel On Full Guard showcases a beautifully complete circular dial. This 1.4-inch AMOLED panel has a resolution of 454 x 454 pixels and is bright, punchy and easy to read in practically all conditions. While the bulk of Wear OS is consistent across all of the various devices, Diesel has attempted to stamp its mark on this particular watch by including some exclusive – and customizable – watch faces. 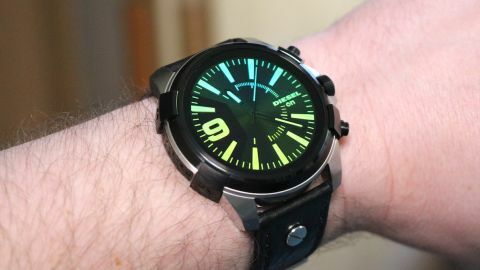 Interestingly, the company has decided to make these faces look like they do on its other (non-smart) watches, right down to the ability to add a special holographic-style effect which changes color when you tilt the watch; this mimics the sheen used on Diesel's standard timepieces and looks really effective. As well as toggling this effect on and off, you can alter other elements of the face and then save your configuration. You can also download additional faces from the Google Play store, or even use one of the default Wear OS ones, if Diesel's offerings are a little too fancy for your liking.